Use the user impact score to determine how important a feature is to your users. Use the prioritization score to determine which features are most aligned with your strategic goals. Note that if the same us provides feedback on the same feature multiple times, their feedback will only count toward the score once. Likewise, if the importance of the feature changes for them over time, the most recent importance value will be used. 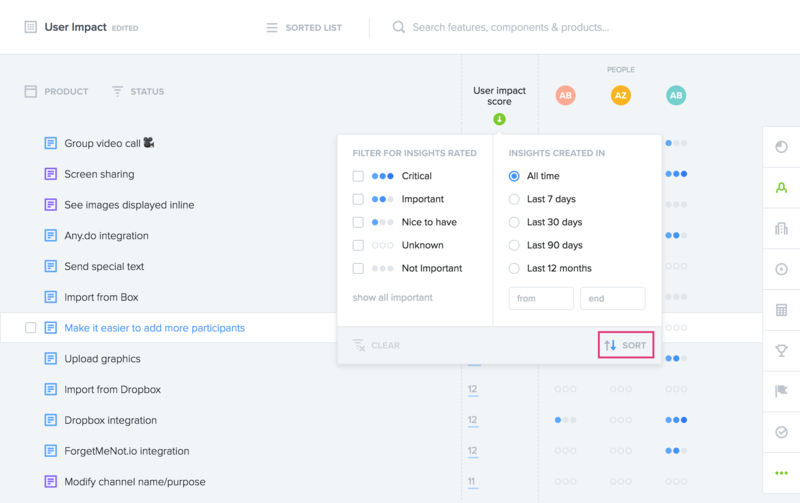 Once the user impact score is added to your Features board, you can arrange your features as a sorted list based on their score. You can also use the User impact score column filter to show just the most pressing feature ideas, or those that at least one us has requested with a given importance value, or across a given time period. The prioritization score is a weighted aggregation of drivers and can be used to quantify the strategic importance of a feature. Like the user impact score, it can be used to sort and filter features ideas so is a helpful way to surface valuable feature ideas. 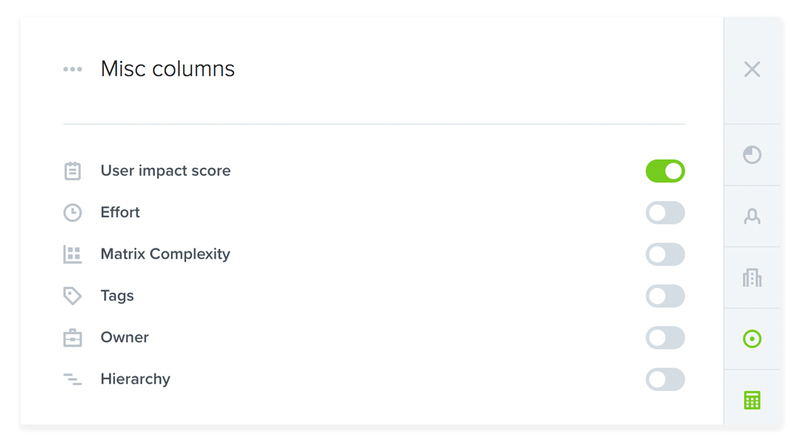 The prioritization score is calculated using a weighted average of each feature's score across all drivers, which can serve to represent any prioritization criteria you'd like. The weight given to each driver (out of a total of 100%) determines the driver's relative contribution to the final score. 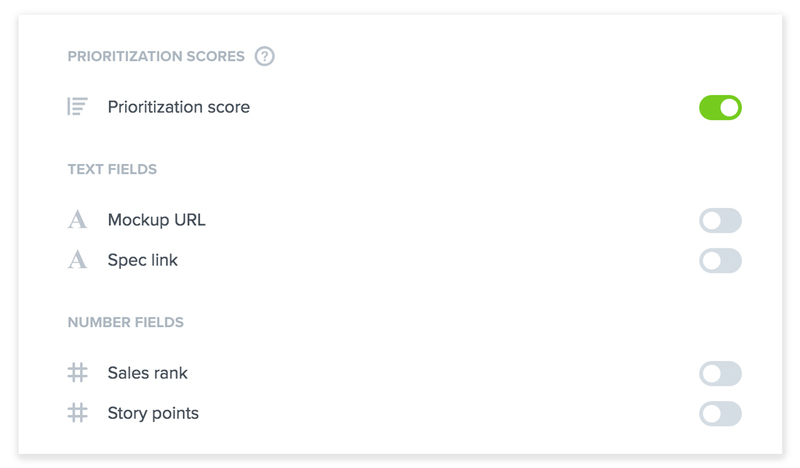 While there's only one user impact score, you can create multiple prioritization scores, each factoring in different drivers with varying weights! Each driver's relative importance is designated by setting its weight on a scale of 0-100%. All driver weights should sum to 100% so their relative contribution to the final score is clear (e.g. Reliability: 25%, Adoption: 50%, Engagement: 25%) though if you're still fine-tuning your percentages, productboard will automatically normalize your weights to calculate a score for you in the meantime. Drivers weighted 0% won't be factored into your score. Start by adding some drivers to your Features board based on your team's current areas of focus. (See configuration bar at right.) Rate each feature in relation to how well it supports each driver. Now add the prioritization score to your board. Next, select the header of the prioritization score column to assign a relative weight to each driver (sum all driver weights to 100%). Dividing by effort will incorporate values assigned to the standard effort column in productboard. It is not yet possible to incorporate objectives or custom effort fields into scores.